Your hidden talents: try new stuff – you might be good! I exchanged a couple of tweets with Chrissie Lightfoot – the Naked Lawyer – about talents the other day. Chrissie mentioned hidden talents, and I remembered a seminar about ‘knowing yourself’ where we looked at a Johari window of our behaviours, versus our intentions. I’ve made a re-hash below – the original (linked above) is better. The seminar was looking at how our intentions (our internal belief about why we are acting in a particular way) are always hidden to others – they only see our behaviours, and judge us on these. The point of the seminar was: you are judged on your actions, so make them consistent with your intentions. e.g. You might think you’re being decisive, but others see bossy and bullying. However, there was one area that wasn’t examined much: those areas of you that are unknown both to yourself and to others. 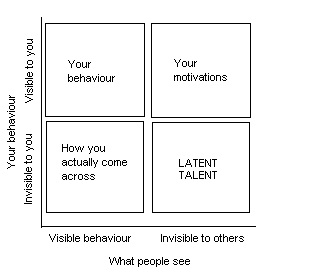 These are your latent, hidden talents. How do you tap this potential? You have to try new behaviours. Some will work well – great, you’ve learned something new about yourself. If you never try, you won’t learn to “know thyself“. You’ll just never know. And this isn’t an ‘ignorance is bliss’ situation – it’s just plain ignorance. Shame.